App works decent! Sometimes notifications are just notifications and there’s no details! I no longer live in MD. WBAL keeps me informed. You send alerts for “breaking” news but when you go to the app there’s no story. If you don’t have a story to back up the alert then stop shoving them at us for goodness sakes. I enjoy the app. I can be at work, get a notification about breaking news, or something, and don't even have to turn on a tv. I love WBAL news station! It’s my favorite “Go to” station! Our family watches it every chance we get for latest news, weather & sports! I especially enjoy the entertainment & the charisma all the reporters portray every morning! It sure puts a smile on one’s face & starts the day off with a bright outlook! Even when cloudy & rainy! Thank you WBAL for your excellent service! Seems like the site is updated when someone has a few minutes. Weekend updates are non existent. So generally not very current. Not representative of what WBAL used to be. Many others have pointed out some news stories stay for days etc. how hard is it to come up with 10 NEWS stories each day? Check it at least daily. 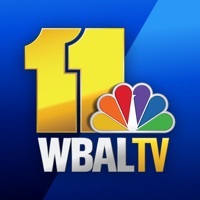 WBAL is preferred by me for news. Constantly bombarded with ads. Some of excessive length. The worst is ads for the newscasters. IS IT POSSIBLE TO GIVE THE APP THE ABILITY TO EXPAND THE WORDS TO MAKE IT EASIER TO READ WITHOUT GLASSES? WBAL is probably my favorite news station, but this constant notification asking me to open the app to continue seeing updates is just ridiculous. If I have my notifications turned on AND I go through YOUR app and customize them like you ask us to do, why do I NEED to open the app every so often in order to keep receiving updates? No other app does this and it's highly annoying. I don't need, want or have the time to read every update you push through. Most times the update headline is enough to peak my interest or not and let me know what's happening. I should never STOP receiving notifications unless I turn them off! Please fix this highly annoying issue. Love your updates and truth telling. Your whole staff is a great credit to your office. Thanks! 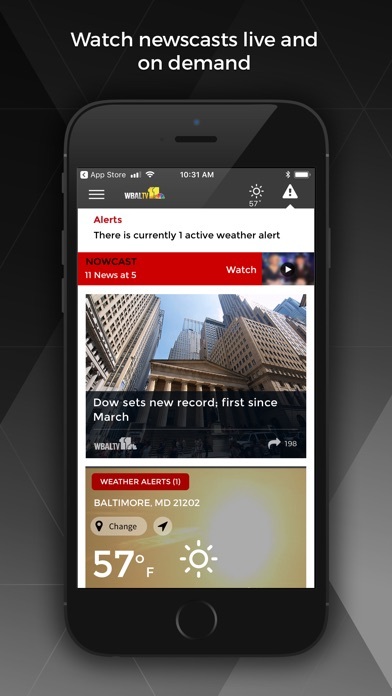 I use this app to check the weather forecast almost daily and thereby see news headlines too. The forecast has been the most accurate that I have seen. Thank you WBAL! Cannot make font larger, stories won’t expand to larger font. News should be current - never more than 24 hours old. Make a separate section for those stories that are do big you want to keep available. It was never broken why did you try to fix it!? Your IT department and web department must do a lot of drinking. Very hard to navigate your website. Most of the time you're interactive radar for weather does not work. It keeps trying to load but it won't load. I really suggest you go back to the drawing board. Ads are very annoying and sometimes prevent you from getting to the news you want to see/hear. Other than that, the App is pretty good! I really appreciate the flexibility of watching news anytime; but the ads are repetitive and annoying! Clean it up before you lose your followers. sorry BAL but your news alerts are so silly i turned them off. wish you showed some discernment. Out of date content is frustrating and pervasive. Too many videos now enough content. Easy to navigate. This is the news app I go to for the latest and updated news and weather forecasts. Keep up the good work! My major turnoff is the fact your site is not updated on a more frequent basis, seems like stories out there for days and I do not expect any updates to the stories over the weekend. Please update your site more frequently! 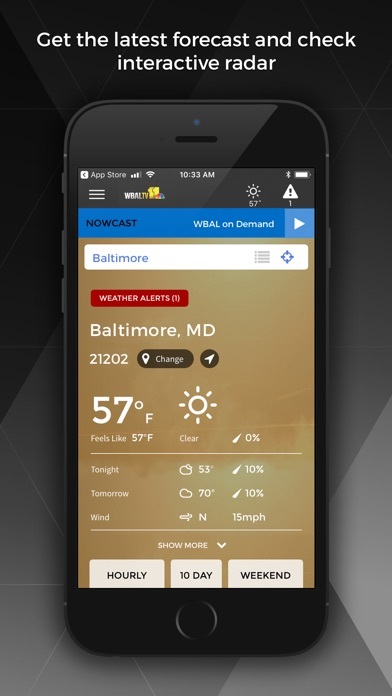 Sorry, WBAL, I’ll always be a loyal watcher, but this app is so crusted with repetitive, invasive ads that I deleted it. Every story you click force plays the same ad you just saw, unless you scroll fast enough to make it stop and scroll back up. Then there’s ads all through the content, some of it junk syndicated stuff- I know you need to make money but this just isn’t working for me. I’m tired of seeing ads for stuff I was just shopping for elsewhere. And you have invested almost nothing in features around good content. The only use left is school closings and I can get that easily elsewhere. If you put the focus back on the user experience, let me know, and I’ll be back. Need to change stories more often. It would be better if date and time is listed for stories. Too many old ones are left in so it is very confusing. I find the app is just okay. I’m alerted by other sources much faster to breaking news. Lot of stale stories hang around too long. And odd alerts pop up to headlines that happened more than a week ago as if they just happened. Need a more dynamic app. I have a problem when a news reporting page that is supposed to be balanced focuses on a women's march that has less people attending than a Right to Life March? You get 6 ads in a row whenever you try to watch a video, after watching all 6 ads they just play again the exact same ones over and over. The WBAL app seems to provide news highlights that are slightly slanted or one-sided. You should rectify this methodology of presenting the news. This app needs some serious overhaul. Stories repeated..many delays..just a shame that no one is paying attention. I use the app everyday for the weather forecast. I love it! Occasionally use it for the news. I like the radar and fact that the weather is updated at least once a day. I wish they would remove old forecasts as they are useless. The problem I find with your app is when I get the alerts, I go to get the information and the article hasn’t posted yet. Very frustrating. Whomever is responsible for creating this piece of trash should be fired! Did they just graduate from Wal•Mart??? Site really stinks. Updated infrequently. Same stories left on here for 5-7 days or more. This site is probably the worst news site that I visit. Three months later nothing has changed. Still the most boring news site around. Can’t you update your stories more often than every 3-7+ days??? I like the app, but I think the postings are not current. Stories are not updated. Oftentimes they remain on the site for days. Please report the news in real time. Many times I receive notifications of breaking news and cannot find the details in the app. I should not have to search for breaking news if you sent me a notification. Now cast is often unavailable. I find your notifications annoying. I have used this app several times a day since it became available. I check it for news, weather and traffic information. Unfortunately it appears that the WBAL app no longer offers traffic info. That option is missing so no more traffic maps or cameras or anything related to traffic that I can find on the app. I depended on this a lot and I’m sorry to see that they removed it. When I receive a news notification and tap on the app, I don’t see the news story, just outdated headlines. I really like the app and I use it just about every day. There are two things that I don’t like. The first is that some stories stay on the app for days or even months and the space could be used for other stories. The second issue is that often times you read a headline and open the story and it has nothing to do with the headline. You really want to read the story that the headline was leading up to but the story that you open has nothing to do with it. A big let down. I like this app but its need to update stories more frequently. At the end of the app are stories that linger a long time. It’s also frustrating to read a story and then get taken back to the beginning of the app, not being sent to where you left off.